If you’ve done an English course in the past but you’re still having trouble understanding native English speakers, it might be because you haven’t spent enough time studying pronunciation. Now I know what you’re thinking: “How on Earth can studying pronunciation help me with my listening skills? !”, well, the fact is that if you don’t know how we (as native speakers) are going to pronounce something, you won’t understand it! It’s not your fault. Have you ever learnt a new word and then suddenly started hearing it everywhere? This isn’t because people have suddenly started saying it more often, now that you know it’s possible, you can hear it. Before, it was just sounds and it meant nothing to you. This is also the reason you should learn your phonemic symbols, because in English we don’t always pronounce words the way they are written. Have a look at how native English speakers would pronounce the pieces of English below. 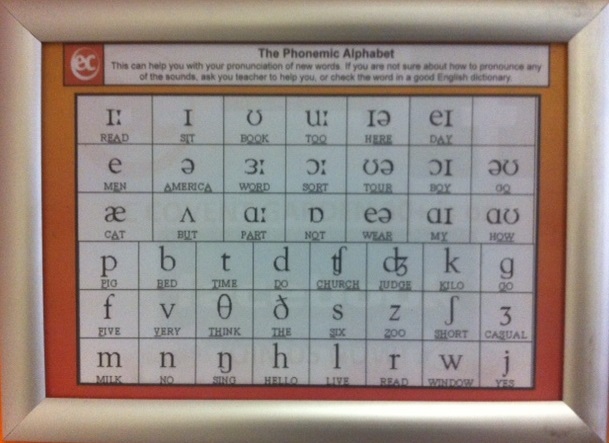 Use the phonemic chart above to help you or click here to hear the sounds. You should notice that there are certain differences between how you would expect these words / phrases to be pronounced and how a native English speaker would say them. But don’t worry, you don’t need to do a whole English course on pronunciation, even from the examples above, you can see there are a lot of patterns. Also, listening to TV shows and films with the subtitles on and noticing how the words are being pronounced can really help you. If you’re thinking about doing some adult English courses in the UK., check out our website for details.